The above prices are subject to an additional $138 for taxes/fees levied on flights that occur as part of the tour. The internal airfares ARE included (any exceptions are listed in red below), but we list the taxes separately on your invoice as they are beyond our control and can change at any time. 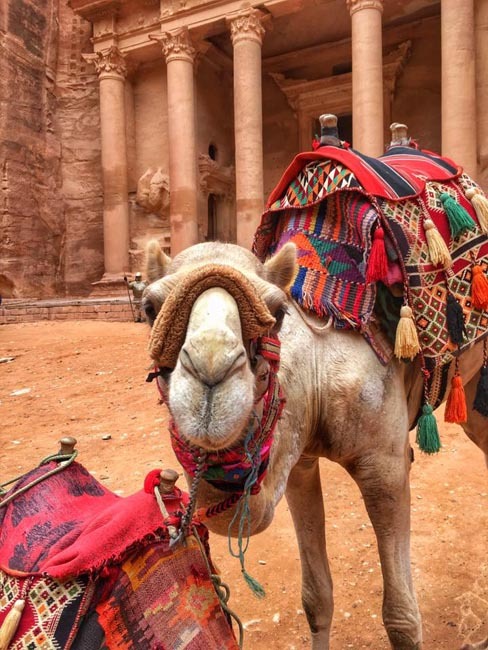 This tour is almost identical to tour EG5 (for which we offer more dates), except on this itinerary Jordan appears first and it includes an extra (free) day in Cairo. Optional Single Supplement: $977 USD (number of singles limited). Few places in the world hold such an array of archeological wonders such as Egypt and Jordan. Steeped in history, Egypt and Jordan tours venture into the ancient capitals and world wonders that have inspired for generations. From the massive stone structures that make up the Pyramids of Giza to the lost city of Petra, these two countries are the chance to visit a fascinating region half as old as time. Our journey as a company began in this captivating region, and since 1987 we have been delighted to take intrepid travellers on insightful tours across Egypt and Jordan. The allure of the mighty pharaohs and their monumental projects never cease to amaze. 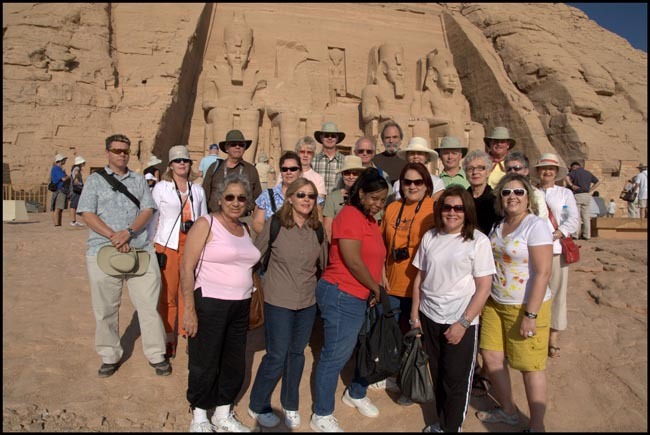 While the Pyramids of Giza are often thought to be the pinnacle of important sites found within Egypt, our groups on Egypt and Jordan tours often remark that they are just the beginning. While aboard a luxury Nile cruise, Egypt and Jordan tours are guided through the colossal range of temples and monuments found on this lifeblood of the desert. Moored on the eastern banks of the Nile, wander between the intricately carved columns of Luxor Temple with buildings that make up the largest complex in Egypt. Walk along the avenue of 1000 Sphinxes at Karnak Temple, which was built, added to, dismantled, restored, enlarged and decorated numerous times during its colourful history of over 1,500 years. Venture to the ancient trading town of Kom Ombo, which is actually two temples in one complete with a mummified crocodile which was once worshipped by the Egyptians. Saddle up with a horse ride in the territory of the Valley of the Kings, to witness not only the destination of the funerary temple of Queen Hatshepsut, the first woman to rule as pharaoh, but also to get a sense of the modern Egyptian life in the quiet countryside villages. With such an overwhelming list of immense temples and complexes, history tends to overshadow the reputation of natural beauty found in the area. Watching the sun rise and set over the sandy expanse of the Sahara as it extends from the green oasis on the banks of the Nile is as memorable as the hieroglyphics carved into the stone. The colours of gold and pink that line the narrow gorge of the souq in Petra are nearly as photogenic as the elegant columns of the Treasury itself. Sharing a cup of tea in a goat-haired tent in Wadi Rum with the Bedouin descendants who made up Lawrence of Arabia's army is an impactful moment of calm and an amazing experience within the land of red rocks that look as though they are melting in the setting sun. The weightlessness one feels while soaking in the Dead Sea's turquoise waters is an unforgettable swim in the lowest place on earth. In a land half as old as time, with features that make this region amongs some of the most rewarding journeys one can take, now is the right time to join our Egypt and Jordan tours, for it is a place that will etch itself into your memory and leave an impression for a lifetime. 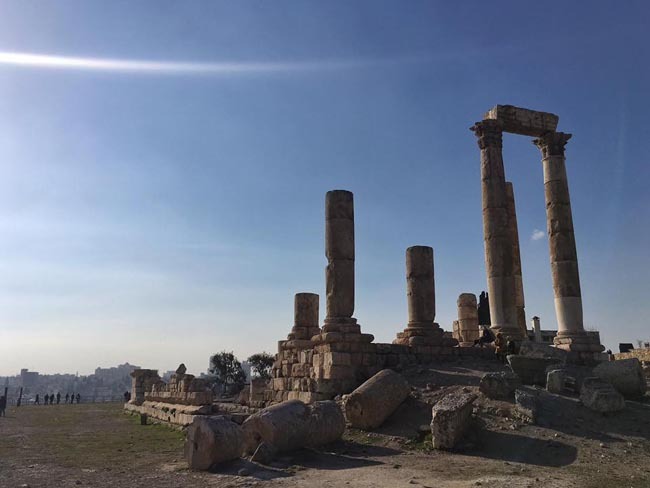 Amman, the modern and ancient capital of Jordan, is one of the oldest continuously inhabited cities in the world, where the city's modern buildings blend with the remnants of ancient civilizations. 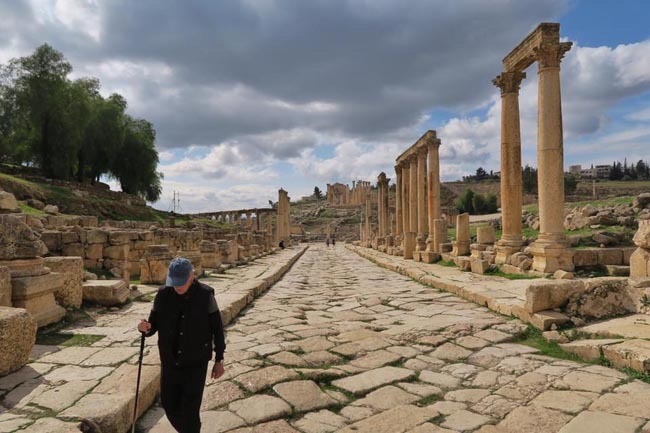 This morning we leave Amman by bus for a tour of the extensive Roman site of Jerash. 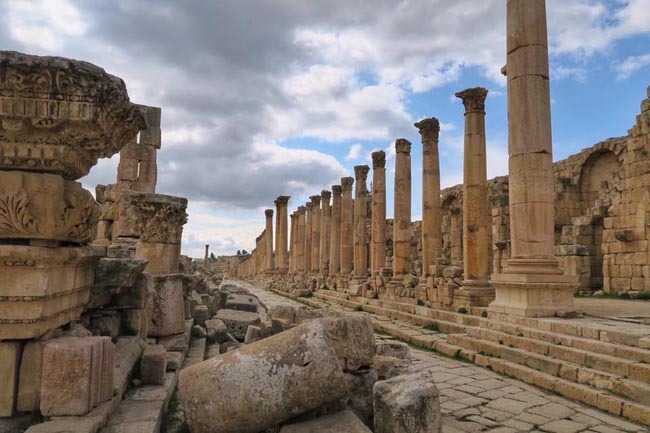 In the 1st and 2nd centuries AD, Jerash was a wealthy city and is today considered one of the most important and best preserved of all Roman sites. 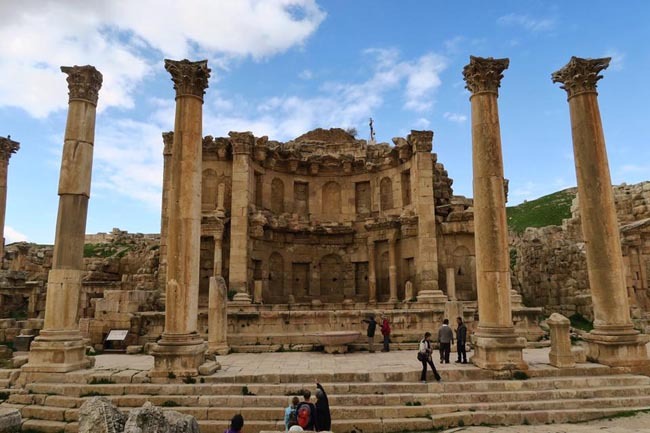 We visit the famous elliptical forum, the beautiful amphitheatre with its superb natural acoustics, and the site of the huge Temple of Artemis. 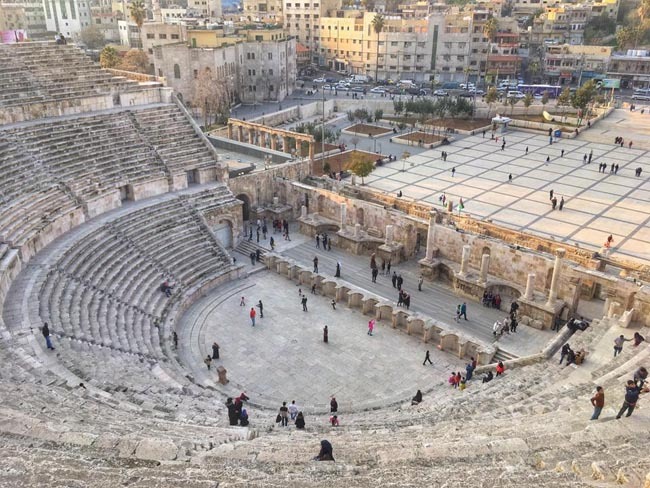 This afternoon we tour Amman, visiting the Roman Amphitheatre, Archaeological Museum, and the ruins of the Temple of Hercules. This morning we travel to Madaba, a small town famous for its magnificent mosaic floors. A unique mosaic covers the floor of St. George's church and consists of a huge map of the Holy Land as it appeared in the 6th century AD. Driving to the edge of the Jordan Valley we reach Mount Nebo from where Moses and the Children of Israel first saw the Promised Land. On a clear day you can look down to see the Dead Sea and the River Jordan. On the other side of the valley is the city of Jerusalem. Here we see a huge mosaic of hunting scenes covers the floor of a ruined Byzantine church. We leave Mt Nebo and travel south; along this route, castles and towns were positioned a one day's travel distance apart. Later we visit Shobak Castle, built by the Crusaders in 1115 and sacked by Muslim forces under Saladin in 1189. We finish our full day at Petra. 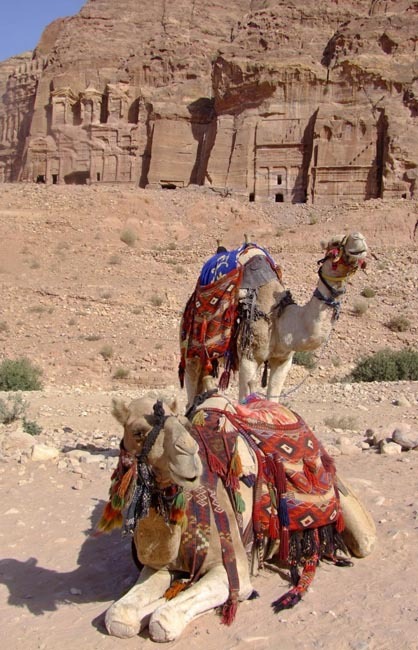 Petra was the capital of the Nabataean Kingdom from the fourth century BC to the 2nd century AD. 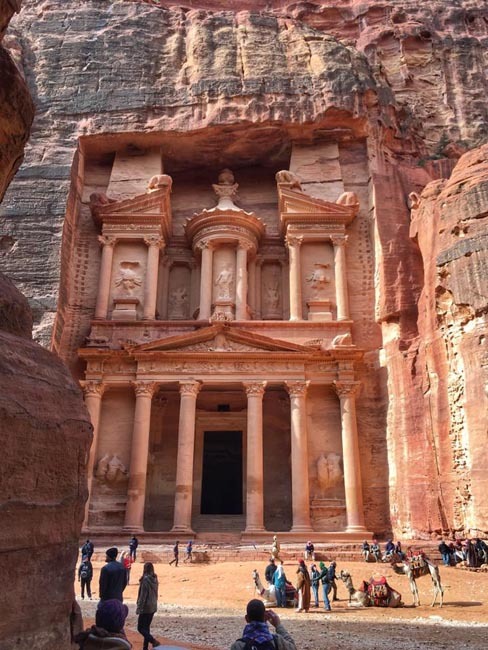 From the 12th century until its rediscovery in 1812, Petra was lost to the world -- a closely guarded secret of the local tribes. Today the 'rose red city half as old as time' is probably the most impressive archaeological site in the Middle East, rivaling the temples and pyramids of Egypt in grandeur. 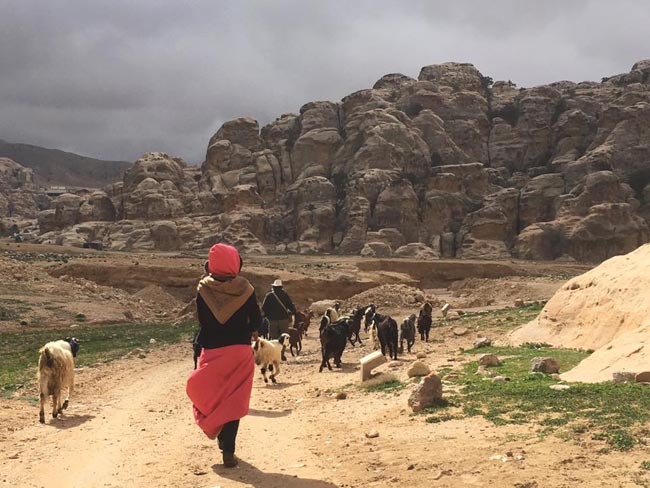 This morning, on our way into the hidden valley of Petra, we will see the Obelisk Tomb and the irrigation system that carried water from a dam throughout the desert city. 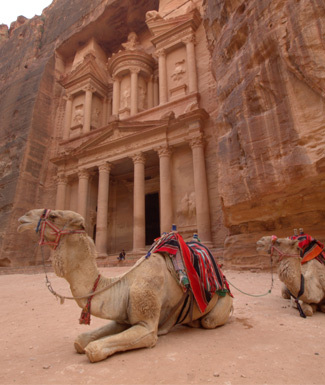 Access to the monuments of Petra is through a narrow gorge in the towering rocks called the 'Siq'. As we emerge from the 'Siq' you stand in awe in front of the 'Treasury' (El Kazneh), a graceful structure carved from the living rock. 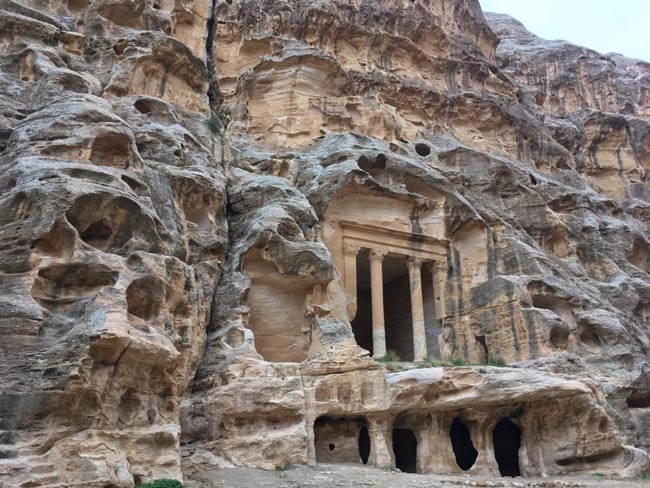 After pausing to admire the elegant columns and carvings we carry on into the valley where elaborate tombs are carved into the multi-coloured walls. Everywhere the sandstone swirls and twists in shades of red, orange, yellow, pink and white. Next we will see the Roman amphitheatre, carved directly out of the mountain, with space for over 3,000 spectators. 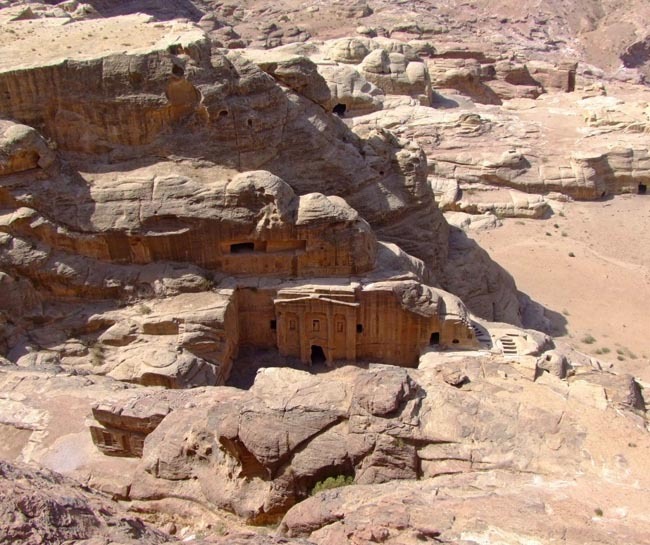 Further on in the main valley of Petra, are the Royal Tombs including the Palace Tomb and the Silk Tomb. 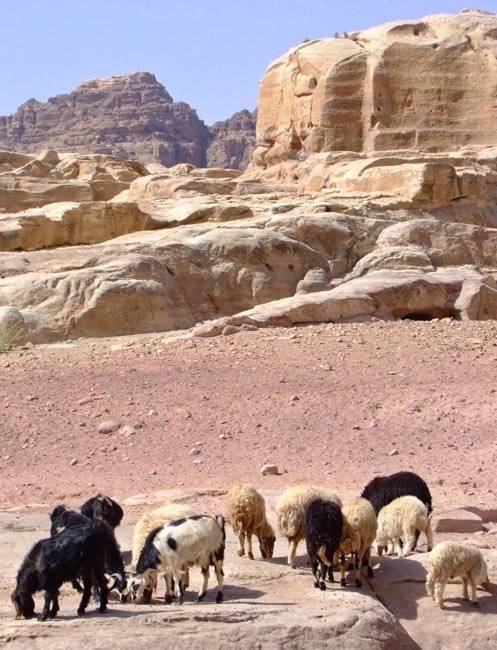 We visit the temple of the Nabataeans' main god, Dushara, and we also see the 'Temple of the Winged Lion'. Our formal guided tour of the site terminates with a visit to the Petra Nabataean Museum. At this point, you may explore further on your own, or return to our hotel to relax and / or shop. You may also take a strenuous walk up a narrow pass to see the magnificent 'Monastery' building, El Deir. 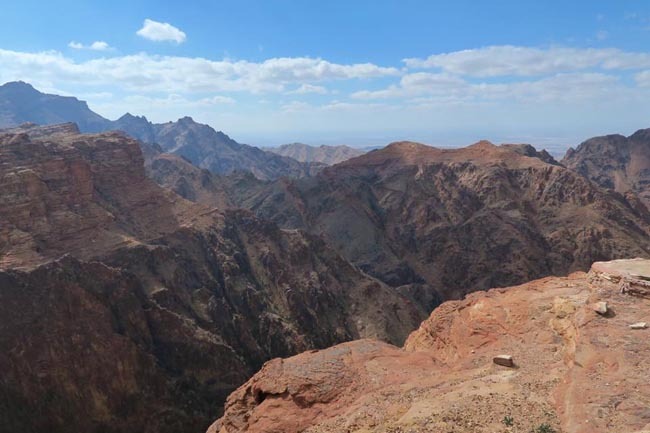 The views of Petra and the surrounding area are expansive. The walk is steep and involves approximately 750 steps carved into the rock and will take APPROXIMATELY one hour up (30 minutes down). NOTE: Access to Petra is by means of footpath only. The main sites occur near ground that is level and well-worn, though the overall site is huge. 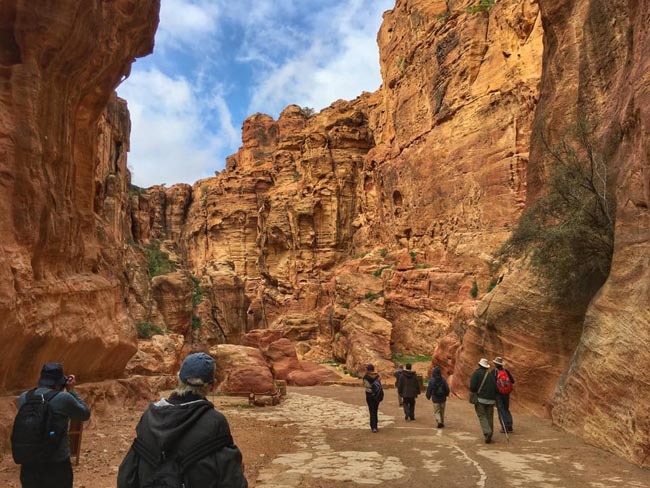 Our pace is leisurely with frequent breaks; however, to fully experience Petra you must be prepared for a considerable amount of walking and little shade. 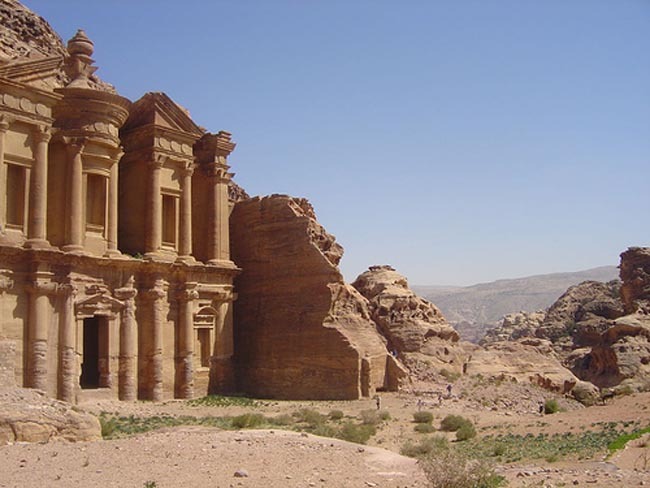 This morning we travel by bus to the nearby Nabatean site of 'el Beidha' (known as 'Little Petra'). We will also see a settlement dating from the Neolithic period, some 8,500 years ago. This is one of the oldest sights in the Middle East; it shows evidence of habitation by a "Pre-Pottery" population who were herders experimenting with agriculture. We return to our hotel by bus. This afternoon, you can either relax or re-enter the breathtaking main site of Petra to further explore on your own. There are a number of scenic walks/hikes that one can enjoy within the site. Ask your Tour Leader for details. Leaving Petra we stop briefly at 'the Spring of Moses', supposed to have magical properties. We then have an excursion into Wadi Rum where Lawrence of Arabia conducted many of his campaigns during the First World War. While at Wadi Rum we hop into smaller trucks and head out into the desert where the sand is red and the rocks look like gigantic multi-layered chocolate cakes melting in the setting sun. We may be invited into a goat-hair tent to share a glass of tea with some Bedouin tribesmen -- the nomadic herdsmen of the desert who made up Lawrence's army. Running along the floor of the valley is the Hejaz Railway that Lawrence blew up repeatedly. Today we include a traditional Bedouin lunch at Wadi Rum in lieu of dinner. We overnight at Jordan's only port, Aqaba, located on the Red Sea. Today we travel along the Dead Sea Highway to the Dead Sea. En route we make a stop at Lot's Cave & Museum. Located 1,329 feet below sea level, the aptly-named Museum at the Lowest Place on Earth features important archaeological finds recovered from the Ghor es-Safi region of Jordan (ancient Zoar/Zoora), including artifacts from Lot's cave. King David, King Herod, Jesus, and John the Baptist were closely linked with the Dead Sea and its surroundings. During the Egyptian conquest it is said that Queen Cleopatra obtained exclusive rights to build cosmetic and pharmaceutical factories in the area. Later the Nabataeans discovered the value of bitumen extracted from the Dead Sea used by the Egyptians. 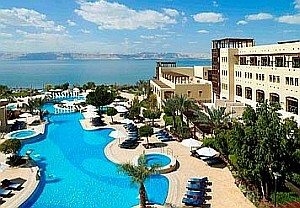 We will arive at our Dead Sea hotel in time for lunch. The hotel is located on the shores of the sea where you will have the chance to swim and experience your amazing buoyancy in the ultra-salty waters. Later today, after some leisure time at the Dead Sea, we check out and transfer directly to Amman's international airport to connect with our flight to Cairo. We are met on arrival and transfer to our Cairo hotel. Al-Qahira, literally "The Vanquisher" or "The Conqueror", is the capital of Egypt and the second largest city in the Muslim World, the Arab world and Africa and the 17th largest metropolitan area in the world. Nicknamed "The City of a Thousand Minarets" for its preponderance of Islamic architecture, Cairo has long been a centre of the region's political and cultural life. 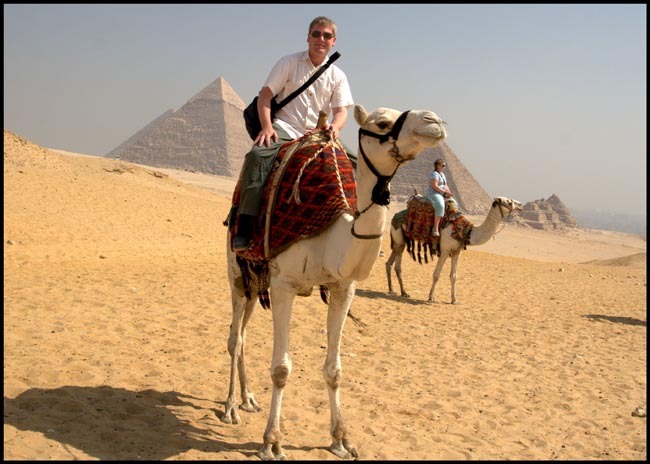 This morning your Egypt Tour Leader will meet with you and discuss your activity options today. You're also welcome to enjoy a day at leisure at our Pyramids-area hotel. 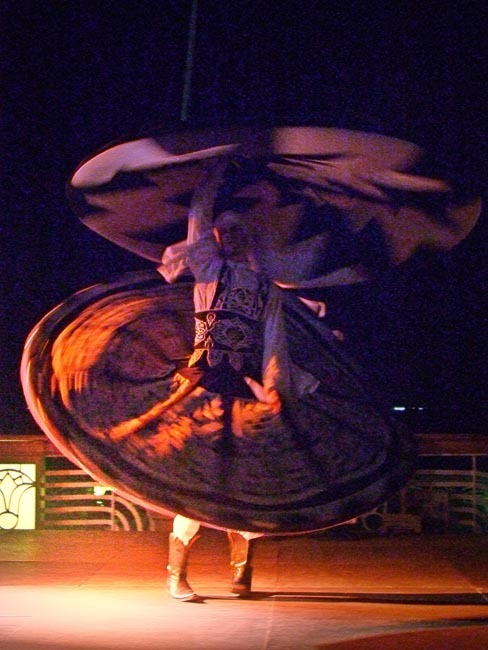 Travellers booked on our Egypt only tour will be arriving during the course of the day; you will meet them this evening prior to our evening meal. This morning we travel to Memphis and Saqqara, chronologically the two most important sites in all of Egypt. Memphis was the capital of Egypt during the Old Kingdom (ca 2700-2180 BC), and Saqqara was used as a burial place for residents of Memphis including kings, princes and nobles. Our drive this morning takes us through the suburbs of Giza, past some small, colourful villages and plantations in the fertile Nile Valley. At the ancient city of Memphis we will see several statues in a garden-like setting, including the colossal statue of Rameses the Great. From Memphis we travel a short distance to Saqqara, the ancient burial site. On the site, considered by many archaeologists to be one of the world's most important excavations, is the Step Pyramid, constructed by Imhotep in the 27th century BC. The pyramid began as a simple mastaba, or long, flat tomb building. Over the course of time, Imhotep added to this mastaba five times -- the pyramid eventually measured 62m (203 feet) in height! After lunch we pay a visit to the Great Pyramids and the Sphinx. Impressive in their grandeur, the pyramids are estimated to have been constructed over a period of 20 years using more than 100,000 labourers each year. The Great Pyramid of Cheops, constructed from over two million stone blocks, is 135m (443 feet) high! You may enter one of the pyramids through a long, narrow passageway and explore the deep inner chambers (extra fee applicable - ask your Tour Leader). Later we visit the Sphinx. This feline-human was named by the Greeks because it resembled the mythical winged monster with a woman's head and lion's body. Legend has it that this "Sphinx" proposed a riddle to the Thebans and killed all who could not guess the correct answer! The Sphinx was carved from one solid piece of limestone and measures 50m (164 feet) in length and 22m (72 feet) in height. Early this morning we travel by road from Cairo to Alexandria. The second largest city in Egypt, known as "The Pearl of the Mediterranean", has an atmosphere that is more Mediterranean than Middle Eastern; its ambience and cultural heritage distance it from the rest of the country although it is actually only 225 km from Cairo (3-4 hours, depending on traffic). We head to the southwest of the city and a hill littered with the remains of ancient walls, architectural fragments and rubble on which stands Alexandria's largest ancient monument, Pompey's Pillar, rising from the ruins of the ancient and famous Serapeion (Temple of Serapis). This column of red Aswan granite with a Corinthian capital, standing on a badly ruined substructure and rising to a height of almost 90ft / 27m, is traditionally believed to have been erected by the Emperor Theodosius. We will also see the famous Roman theatre of Alexandria. Dating back to 2nd century AD, this theatre is the only one of its type in all of Egypt. We also visit the Roman Catacombs, the last existing major construction for the sake of the old Egyptian religion. Though the funerary motifs are pure ancient Egyptian, the architects and artists were schooled in the Graeco-Roman style. Applied to the themes of Ancient Egyptian religion, it has resulted in an amazing integrated art, quite unlike anything else in the world. Another highlight today is a visit to Bibliotheca Alexandria. Once the greatest library in the ancient world, the Bibliotheca is dedicated to "the writings of all nations." Now a UNESCO World Heritage Site, the modern Bibliotheka cost some USD150 million, all by donation from Saudi Arabia, the UAE and Iraq. We return to Cairo in time for dinner. Early this morning we fly from Cairo to Aswan in Upper Egypt. 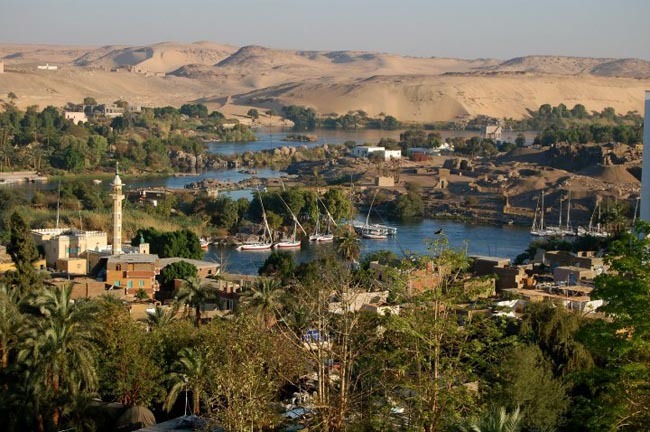 * Aswan is Egypt's sunniest southern city and an ancient frontier town. Small enough to walk around and graced with the most beautiful setting on the Nile, the pace of life in Aswan is slow and relaxing. Upon arrival we have a leisurely sail on a felucca, a traditional sailing vessel used for centuries for carrying goods and passengers along the Nile. * NOTE: The actual order of our Aswan area sightseeing may vary depending on incoming flight schedules and other logisitical considerations. Very early this morning we travel by road (+/- 3 hours, each way)* south from Aswan across the Western Desert to Nubia, or the "Land of the Gold". Our destination this morning is the impressive Abu Simbel -- the imposing rock temples of Rameses II and his queen, Nefertari. We have a guided tour of this site, including the interior of the colossal temples. The Temple of Rameses II, with its immense statues of the Pharaoh seated on his throne, is one of the classic images of the power of the Pharaohs. Inside the temple you will see well-preserved wall decorations and several murals. 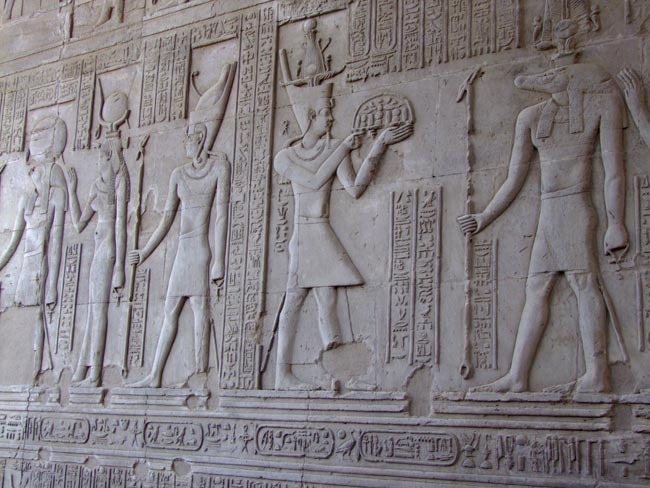 There is a wonderful relief of Rameses presenting captives to various gods, including himself! We also gain insight into the reconstruction process by visiting the interior of the artificial mountain. We travel back to Aswan making a brief stop at the High Dam en route. Constructed between 1960 and 1971, the High Dam collects and stores water over a number of years so that the annual Nile flood can be controlled. From here we will have a panoramic view of Aswan to the north and Lake Nasser to the south. 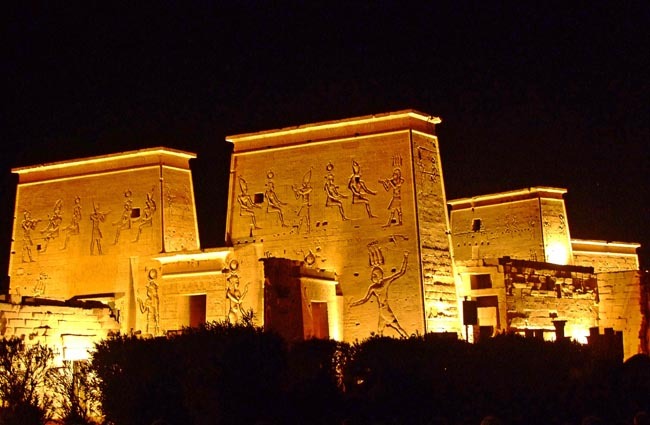 This evening we will attend the Sound & Light Show at Philae Temple. The temple is situated on an island, and we have to take a boat to get to the site. It is a good idea to have a small flashlight with you. * We choose to travel by road instead of flying as the schedules tend to be rather restrictive and not allow enough time at the site (much time is taken up by check-in, security, boarding, transferring etc). Driving frees us from this inconvenience and adds flexibility, plus allows us to see the High Dam en route. Departing very early ensures that we are at the site at the optimal time for photography; later in the morning, shadows fall across the temple making conditions less than ideal. This morning we will take a private boat across the River Nile to the west bank. From here we travel by camel across the sandy desert to the Christian Monastery of St Simeon. Before we begin this easy trek our Tour Leader and camel trainer will teach you the technique of riding a camel. 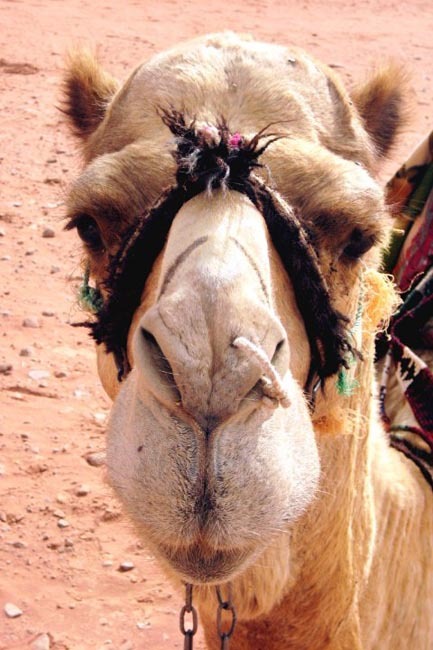 This is a journey that can be undertaken by anyone at any age (one rider per camel). Our trek is about 45 minutes to the monastery, and then 15 minutes back to the riverbank. Those who prefer not to ride can travel by open truck to the monastery and meet up with the group there. Dating from the 6th century, and in use until the 13th century, the Monastery of St Simeon is one of the best preserved Christian sites in Egypt. Inside we will see the chapel, living quarters, kitchen and dining areas, wine press, bake area and storerooms. On our tour we will also see the remains of some Coptic frescoes -- depictions of Christ and saints as well as many geometric patterns. 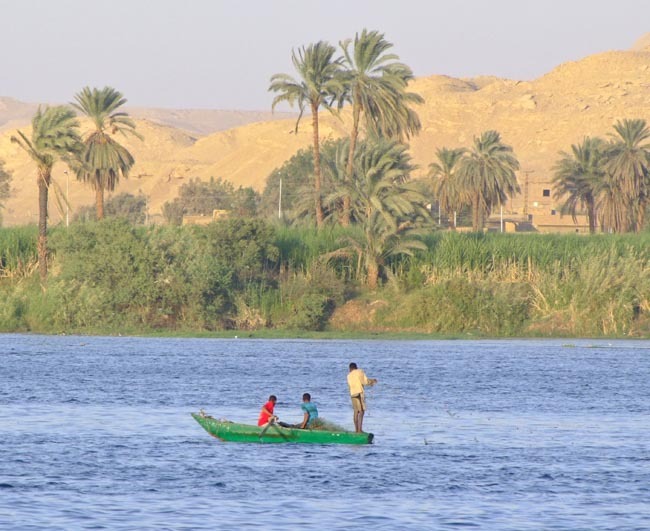 We then return to the banks of the Nile and re-board our boat and ride among the islands dotting the Nile. Up the hill, above the river, is the Mausoleum of the Aga Khan, spiritual leader of the Ismailis, a Shi'ite sect based principally in India but with followers around the world. The tomb is an elegant pink granite structure of late 1950 origin. The main island in the middle of the Nile is called Elephantine Island because many of the rocks look like elephants bathing in the Nile. On the west side of the river is the beautiful Kitchener's Island, where we will have time to stroll through the rich botanical gardens with trees, plants, and bushes. 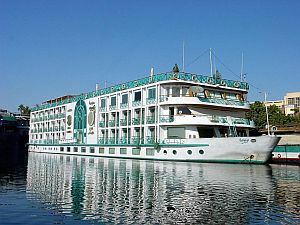 At around midday we board our Nile cruise vessel (which remain docked in Aswan until tomorrow) and enjoy lunch on board. This afternoon you may enjoy a free afternoon in the town of Aswan either on board the ship or in the town of Aswan. 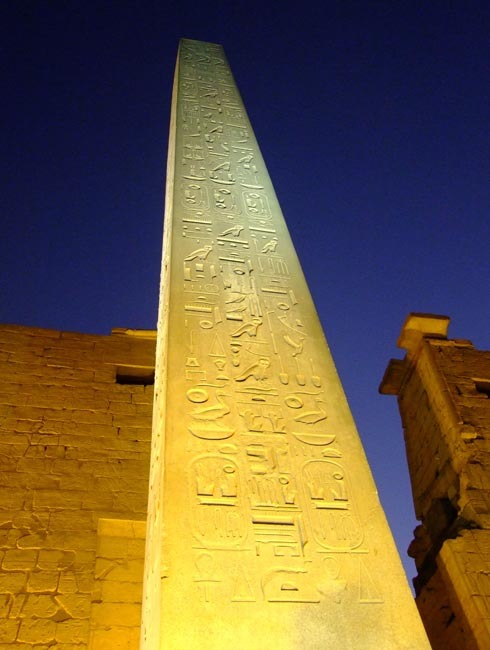 During our time in Aswan, we will also include a visit to the 'Unfinished Obelisk' and Philae Temple, also already visited, but some passengers enjoy seeing it again during daylight hours. These visit may be operated by the cruise ship. Overnight on Nile cruise. NTS cruise (or similar). 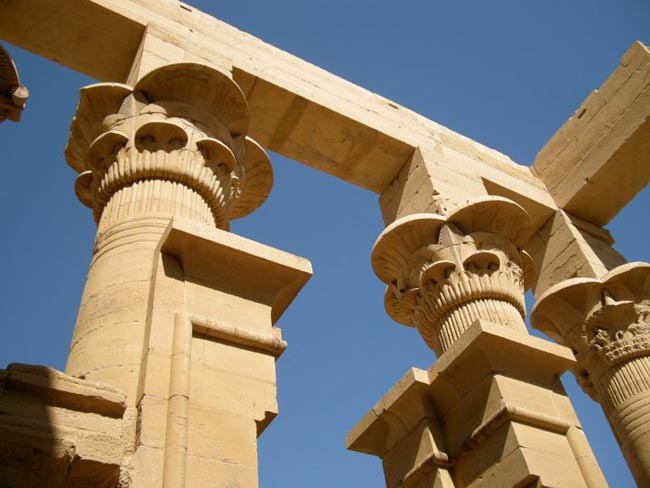 Today our cruise will make a stop and visit the Temple of Kom Ombo. In ancient times, Kom Ombo was strategically important as a trading town on the caravan route from Nubia to Cairo. Kom Ombo, actually two temples in one, is dedicated dually to Haroeris and Sobek, respectively the god of the sky and the crocodile-headed god. Here we are able to see the remains of a mummified crocodile. Crocodiles no longer exist in the Egyptian part of the River Nile, but in Pharaonic times they lived here in great numbers and were worshipped as gods! From Kom Ombo we continue along the River Nile toward Edfu. 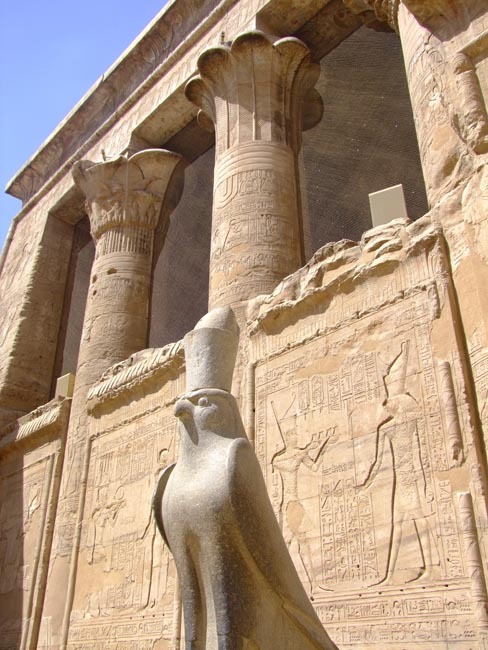 As the largest and most completely preserved Pharaonic temple, albeit Greek-built, Edfu is dedicated to the god Horus. Construction of this temple began under Ptolemy III Euergetes I in 237 BC. We will allow time to explore this massive and impressive site, enclosed by walls and flanked by two large pylon gateways. Here we will also be able to see a Nilometer -- an ancient technique of measuring the Nile's water fluctuations and setting the level of taxes (depending on cruise schedules, this visit may take place tomorrow morning). Overnight or early this morning we will have arrived at Luxor. Today we visit Luxor Temple. The temple was dedicated to the Theban Triad of Amun, Mut, and Chons and was built during the New Kingdom, the focus of the annual Opet Festival, in which a cult statue of Amun was paraded down the Nile from nearby Karnak Temple to stay there for a while, with his consort Mut, in a celebration of fertility. Luxor temple is considered one of the largest ancient Egyptian temple complexes situated on the eastern bank of the river Nile. At the entrance is a huge tower built by King Ramses II. Overnight on Nile cruise (docked at Luxor). NTS cruise (or similar). Today we disembark our cruise and move to our hotel in Luxor. This morning we make an excursion the Valley of the Queens. * After crossing the Nile we will board our bus for the short journey to visit this wonderful necropolis on the western shore of the Nile. The Valley of the Queens was used as a burial site for the royal women of the 18th, 19th and 20th Dynasties. Ancient Egyptians called this place "Set Neferu" meaning Seat Of Beauty, and today only a few of the eighty tombs are open to the public. We will visit 3 tombs. The Valley of the Queens holds far more than graves of queens. As well as our visit to the Valley of the Queens we will also have a guided tour of the workers' village and the Madinat Habu temple. 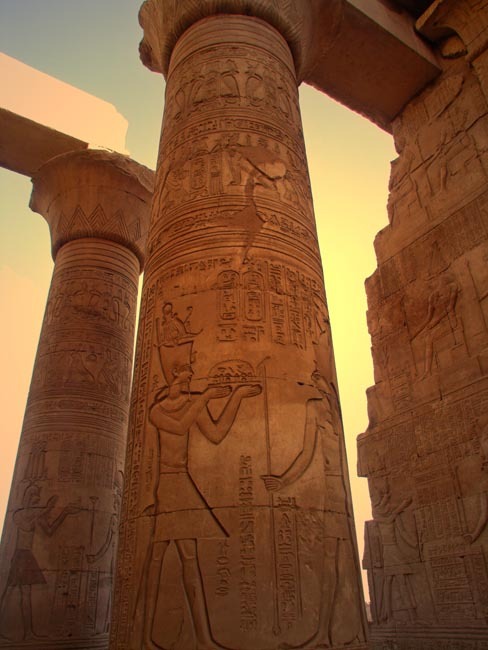 Madinat Habu, also known as the temple of Rameses III was known in ancient times as Djanet, and according to ancient belief, was the place were Amon first appeared. Both Hatshepsut and Tuthmosis III built a temple dedicated to Amon here, and later Rameses III constructed his larger memorial temple on the site. * Due to periodic and unannounced closures of the tombs at the Valley of the Queens, your Tour Leader may substitute the Tombs of the Nobles, which are equally interesting. Early this morning we cross the River Nile by boat to the West Bank where the wealth of antiquities is outstanding. On the other side we will meet our transport for our excursion into the Valley of the Kings. We will accomplish part of our journey today by donkey. We'll "saddle-up" and begin a leisurely ride through the New Gourna Village and into the countryside. Avoiding the busier road, we will witness quiet village life along the way for about 40-45 minutes before re-uniting with our road transport for the final leg into the Valley of the Kings. (Alternative arrangements can be made for those who prefer not to ride). 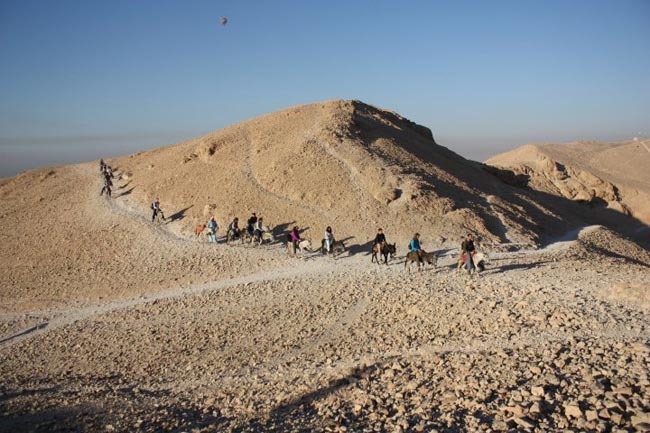 Once in the isolated valley, dominated by large pyramid-shaped mountains, we will have a guided tour of three of the many tombs that are here. * The valley was the burial ground for kings throughout the New Kingdom. Note that some of the tombs have steep stairways and all are quite dark inside (you might find a pocket flashlight useful). We then proceed to the funerary temple of Queen Hatshepsut -- the first woman to rule as pharaoh! We have a tour of this impressive complex, discovered in the mid-19th century and still under restoration. After our tour we return by bus through the countryside back to the river and the East Bank. 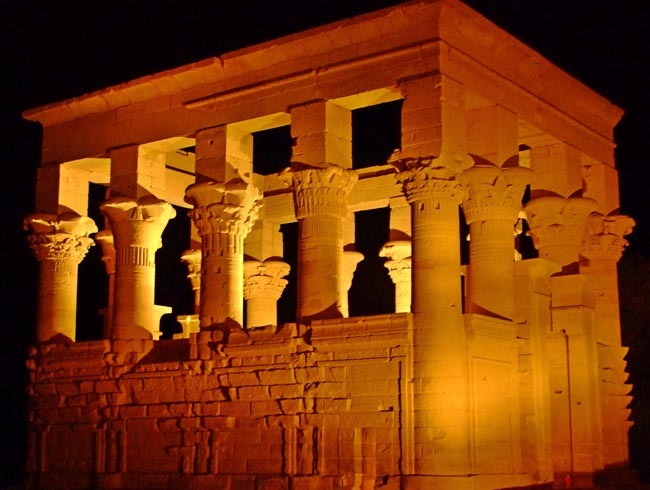 Tonight you may choose to visit the Sound and Light show at Karnak Temple (optional). * We do not include the tomb of King Tut, as it is very small and not very interesting, relatively speaking, but we allow time for you to see it if you wish (separate ticket). This morning we visit one of the most fantastic archaeological sites in the world: Karnak Temple. Karnak was built, added to, dismantled, restored, enlarged and decorated during its colourful history of over 1,500 years. At certain points in Egyptian history, this temple was the most important in all of Egypt. 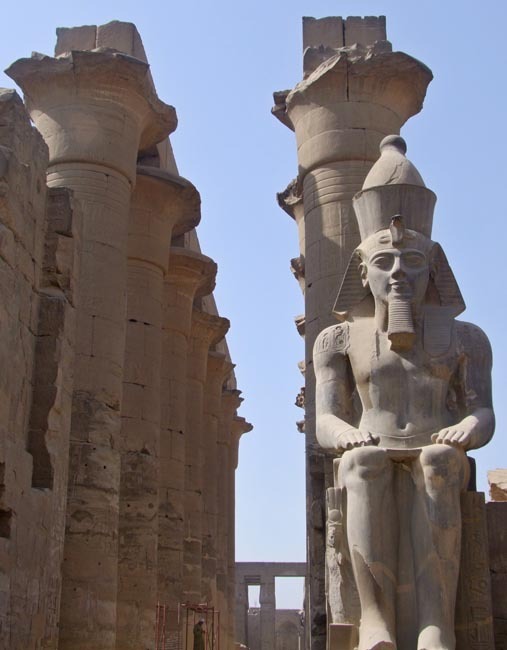 When we arrive at the temple you will be awed by the grandeur of the tremendous pylon gateway and the Avenue of 1,000 Sphinxes that originally ran all the way to the Nile and Luxor Temple! We will have a guided tour of the complex, massive by any standard. During free time this afternoon, we suggest a visit to the excellent Luxor Museum or Mumification Museum. Today we fly back to Cairo. On arrival we proceed to the famous Museum of Egyptian Antiquities* where enjoy a guided tour of some of Egypt's most beloved treasures. Among the 100,000 pieces housed on the museum's two floors is the famous exhibit of Tutankhamun whose tomb was discovered by Howard Carter in 1922. The tomb and treasures of this young Pharaoh, modest by Pharaonic Egyptian standards, is perhaps the best preserved of the discovered tombs. We also see archaeological relics from the Old Kingdom, Middle Kingdom, New Kingdom and Greco-Roman periods. We also allow some time for you to explore the treasures on your own (extra fee: ask your Tour Leader for the current rate). We then proceed to Islamic Cairo where we will tour the Citadel, begun by Saladin in the 12th century. Today the Citadel's buildings are mainly from the Ottoman period, and are truly grand. From the Citadel, actually a complex of three mosques and four museums, we enjoy an amazing view of Cairo spread beneath the hilltop. Here we will see the fabulous Mosque of Mohammed Ali, also known as the "Alabaster Mosque." * A new museum is being built, though the opening date is as yet unclear (projected 'partial' opening in December 2018). As the move takes place, some items may not be on display in either location. Once the museum opens, it will become a part of this itinerary. Today we drive through the neat, tree-lined streets of the Garden City area to Coptic Cairo, the centre of Christianity in Cairo. * We will walk the cobblestone streets and stop at a few of the churches, including that of Saint Sergius, presumed to be the spot where the Holy Family lived during their flight into Egypt. The present building dates from the 11th century. As we stroll along we will come to the recently restored Synagogue of Ben Ezra, the oldest Jewish synagogue in Egypt. Despite the 45 Jewish families that remain in Cairo, the synagogue is no longer operational. We then make a stop at the Khan el Khalili Bazaar, one of the most interesting bazaars, not only in Egypt, but also in the whole Middle East. The atmosphere of this traditional market, together with the labyrinthine layout of the streets, gives visitors a glimpse into what medieval markets once were like. * The Coptic Cairo section of our program exists here in a tentative basis given ever-changing security considerations in this district. Your Tour Leader will advise of the current status once you have arrived on tour and a substitution may be put into place. AlQasr Metropole Hotel is a charming four star boutique hotel, with a breathtaking view of the capital Amman, with 66 ... It is located in Shmeisani, one of the most prestigious and commercial areas in the capital. It is within walking distance to most of the major banks, shopping arcades, other reputable hotels, many business centers and the acclaimed cultural street of Amman. AlQasrMetropole is the ideal destination to combine business, pleasure and fun. AlQasr Metropole boasts its dedication to provide services that are not only personable but which also provide affordable 5 star hotel services. 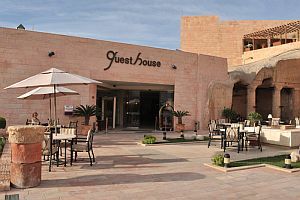 The hotel is notorious for its great outlets, which are considered to be Jordan's most popular. The newly renovated lobby has uplifted the hotel to create an even higher standard of services and appearance. 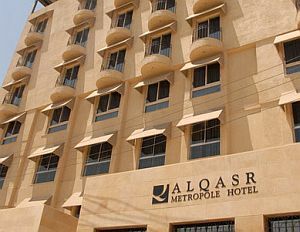 AlQasr Metropole is Amman city's first hip, trendy and chic boutique hotel. AlQasr Metropole Hotel has set high standards of excellence, with the help of its friendly and attentive staff, and it will certainly make sure all your needs are tended to. Adjacent to the Petra Visitor's Center, this elegant hotel with views of the Petra mountains is less than a minutes' ...	from the entrance to the ancient rock-cut city. 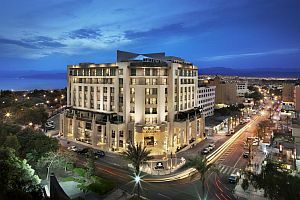 Set in the city's business district, this upscale hotel is a 4-minute walk from Aqaba Marine Park, 1 km from ...	Archaeological Museum and an 8-minute walk from the marina. Luxurious surroundings, majestic views, incredible sunsets. Relax and rejuvenate at this stunning resort tucked between the mountains and the Dead ...	near ancient, sacred sites. Almost every guest room features a view of the Dead Sea, as well as comforts such as individual climate control, mini-bar and luxurious bedding. 3 swimming pools with 4 whirlpools. 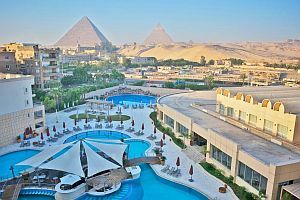 Offering pyramid views, this high-end hotel is 2 km from The Great Pyramid at Giza, The Grand Egyptian Museum and ...	Great Sphinx of Giza. Featuring views of the pyramids, the sophisticated rooms offer free Wi-Fi, flat-screen TVs and desks. 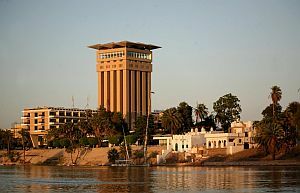 A 14-minute walk from Elephantine Island, this upscale resort hotel overlooking the River Nile is 2 km from Nubia Museum ...	3 km from the ancient Unfinished Obelisk museum. 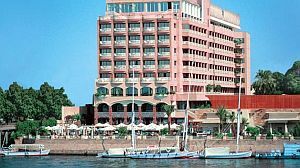 Welcome to five-star splendor on the banks of the Nile in a city of ancient pharaonic treasures, the Sonesta St. ...	Hotel Luxor redefines magnificent contemporary style. The hotel is luxurious, sophisticated and above all, elegant. Come and enjoy a sweeping terrace with majestic views of the Nile, a grand entrance of polished marble and handsomely appointed furnishings with exquisite detail, a sumptuous health spa, an array of fine dining choices and every amenity to please the most discerning traveler. With the mystical Nile just a whisper away and the temples of Luxor and Karnak preserved in time, experience a city of fascinating antiquity and indulge in the rich splendor of the Sonesta St. George Hotel Luxor. This elegant Nile Cruise features deluxe accommodation with broad panoramic views, bathrooms with full-size bathtubs, Elevator on board and all ...	conveniences. Enjoy a swim in the outdoor pool, experience the exciting nightlife in the ship’s discotheque or a relaxing massage treatment at the spa. Elegant amenities on the Nile Goddess cruise ship are delivered with deluxe touch of hospitality. Breakfast and dinner are included daily; all meals on the Nile cruise. All transport, accommodation, sightseeing and entrance fees for sites noted as 'visited' in the detailed itinerary. Gratuities for drivers, restaurant staff, porters, local guides. Airport transfers for land & air customers arriving/departing on tour dates. International airfare to/from the tour. Tour Leader gratuities, most lunches, drinks, personal items (phone, laundry, etc), international (if applicable) and domestic air taxes, visa fees, and any excursions referenced as 'optional'. Airport transfers for Land Only customers. Optional trip cancellation insurance. * Our post-reservation trip notes offer further guidance on shopping, not included meals, visas, locally-paid departure taxes. * Insurance: When considering travel insurance for this tour, please be especially mindful of possible exclusions of coverage for destinations that currently have government travel advisories in place. It is incumbent on you, the traveller, to ensure that you are comfortable with what your chosen policy will and will not cover. This tour is offered in fall when temperatures are much more comfortable than the period May-Sept. In Jordan, fall brings the harvest of dates, melons, grapes, and many other local crops. Showers are possible both times but the overall area is arid on average. Egypt will be comfortable throughout, with the possibility of some midday heat while in upper Egypt. Rainfall is rare in Egypt year-round. 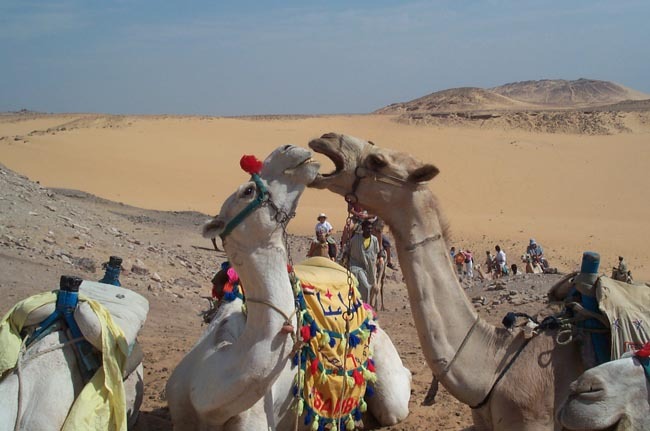 EGYPT: Over two weeks we travel by bus, felucca sailboat, luxury cruise boat, horse carriage, plane, donkey, and camel. Distances covered are not great and roads are good. The tour is not strenuous though it is busy; you must be steady on your feet and be able to endure some heat and some extensive archaeological sites. JORDAN: Ground transport provided by private air-conditioned motor coach, 12-36 seats depending on ultimate group size. The tour is not strenuous though it is busy; you must be steady on your feet and be able to endure some heat and long travel days. Our rating "Level 2" on this tour refers to its ambitious nature, full days, possibly some early starts, and plenty of time spent on your feet. 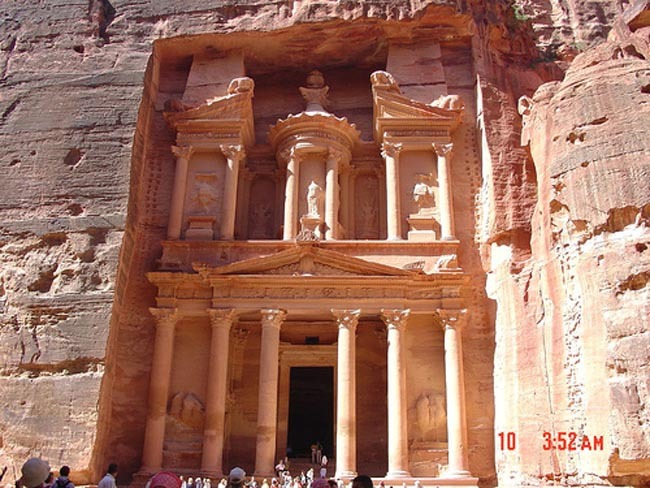 Many sites visited are LARGE and the only access to Petra is by foot. Surfaces are uneven and sloped, and stairs will factor into our visits; heat can also be a factor in some locations which can, over time, cause fatigue. If you rely heavily on a cane or any other mobility aid, we regret that this tour would not be suitable. Though baggage handling is available throughout, you must still be able to fully manage yourself and your things, especially at airports. Though Egypt has enjoyed a prolonged period of stability and our tours are operating on a "business as usual" basis, we encourage all travellers (as we do for any destination) to review online government advisories that provide guidance on, among other things, issues concerning security. We are presently very confident that your journey will be problem-free, and want to ensure that you feel likewise before choosing to join this trip. Hotels are clean, well-located, air-conditioned, 3-4 star (maybe the odd 5-star - click on 'Map & Hotels' elsewhere on this page). Some properties have outdoor swimming pools. Single rooms are limited in number and possibly smaller than twins. The Nile cruise vessel is very comfortable with full air-conditioning, twin-berth, outside cabins with en suite bath/toilet. Tour Leader throughout, local drivers, local guides at various locations.